This is a super quick and easy lunch. Also, is there a preschooler – or mama – that doesn’t like pizza? 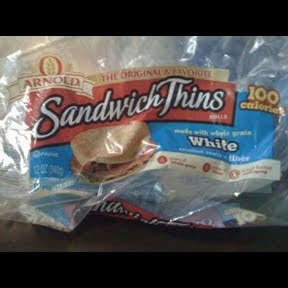 First, you need some sandwich thins. These are little rolls that you can get at your grocery store. There are several brands. I’m using Arnold brand. Next, you’ll need some sauce. I almost always have a jar of spaghetti sauce in my refrigerator but you could also use Alfredo sauce. You’ll also need toppings. Basically you could use almost anything leftover from your fridge. Chopped up lunch meat, left over chicken, fajita steak leftovers, whatever. Use your imagination. 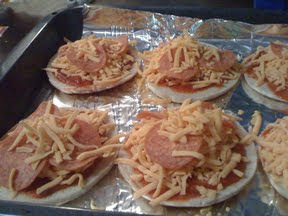 I have a kid who loves pepperoni so I am using that to make a traditional pizza. Add the cheese of your choice and voila! You’re ready to pop it in the oven! I cook these for about 12 minutes on 425 degrees. But my oven runs a little cool so adjust as necessary.